Branding is a term that tends to be unclear and carries many different meanings along with it. Most people will say it is the company logo, to others it's a product. Let's clarify what branding really is. At it's core brand is an emotional experience. It's a person's perceptions about your company, product or service. Branding is about creating an impression about what makes you unique in the mind of others. When a customer thinks about your brand, it's tied to a feeling in their mind. There's an association there and it's your responsibility to create that association and you have to manage it on an on-going basis. Think about how when you smell, see, touch or hear certain things, it triggers a memory in your mind. Like a song that triggers the same memory every time you hear it, branding is about making sure that when a customer sees your logo, walks into your store, or receives an advertisement, that this connection in their brain aligns with what makes you unique. It's genuinely important that it aligns with associations that create a sense of who you are, what you're selling, and why they want it. Looking at it another way, a brand is really just a feeling, and the goal of good branding is to dictate exactly what that feeling should be, and to create in the mind of your ideal customer, the belief that there is no other product or service on the market quite like yours. In branding, we work to figure out what this feeling and perception should be, and make sure that we don't communicate anything that could change that perception. By building a powerful brand, you'll have crafted a powerful marketing platform, and a good brand makes the sales process much easier. Branding encompasses three main elements. First is the visual branding - the design of your logo, website and collateral materials. Second is the messaging that clearly communicates the core values and why the company is unique, which includes all of the copy and tagline. Then thirdly, there is the positioning of the brand, i.e. placing the company as higher quality than competitors or lower price etc. This guides everything in your marketing strategy and business plan. When we create a Brand Strategy for your company, we take all the information that we gather about your company and competitors and build a solid strategy. 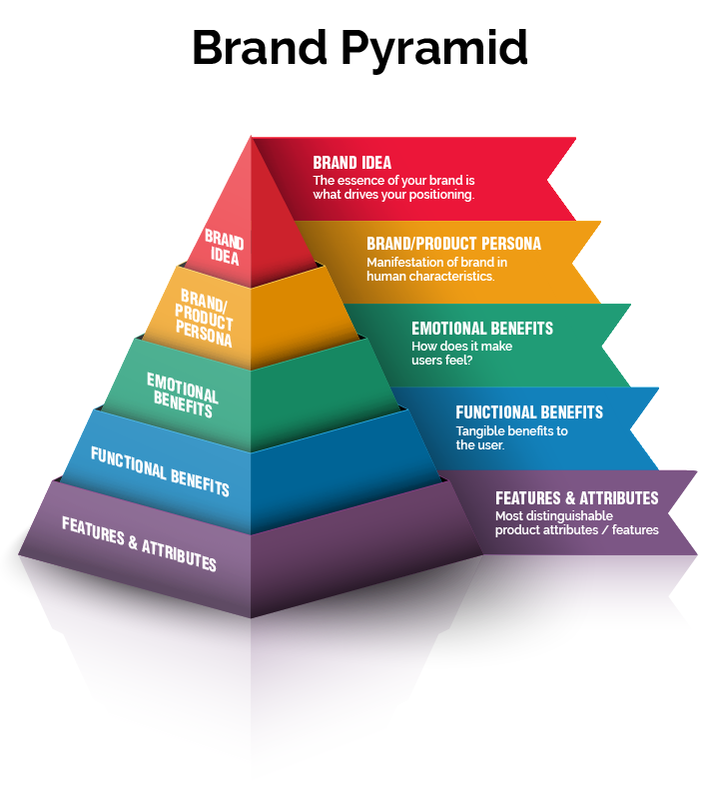 One of the elements we create is your Brand Pyramid which is a useful tool to define the essence of your brand – some call it your brand DNA. Defining your brand foundations and brand deliverables it in a visually succinct way helps clarify (for you and your employees) what your brand really stands for. It is an internal document, rather than something you would share with customers or partners. We hope this helps in understanding the what Branding is. There is much more involved in the actual process but hopefully this provides an overview of the process and why it is important. See our intake questionnaire that we use to begin the process of creating your unique brand. If you would like to discuss it further, contact us to set up a time for a free consultation to find out how we can take your company to take it to the next level.